The Black & Decker 18-Volt Cordless Electric 12-Inch Grass Hog String Trimmer looks like a cool way to trim around your property and gardens. This is a great gift idea for the guy looking to replace his current trimmer or simply looking for his first one; an excellent tool for trimming the edges. 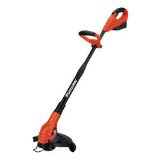 Cordless Electric String Trimmer @ Amazon.com .